Approaching from the Strand, turn onto the Salthouse Dock opposite the Hilton Hotel. Continue straight on passing the Pumphouse Inn on the right and the Maritime Museum on the left. The quickest route to us is across the Hartley Bridge. This bridge can sometimes be closed to pedestrians with very little notice to allow boats into the Albert Dock. These closures are generally only for a short time. Bike racks are located in the Mermaid Courtyard, adjacent to Tate Liverpool. Liverpool ONE Bus Station on Canning Street is directly opposite the Albert Dock, approximately 365 metres from Tate Liverpool. Route C4 also stops at the Albert Dock. The nearest train station to Tate Liverpool is James Street station, Liverpool L27PQ (720 metres approx.). For travel within Merseyside plan your journey at merseyrail.org. Mainline rail tickets to Liverpool Lime Street station are valid for travel to James Street Station. Mersey Ferries from Seacombe and Woodside on the Wirral call at the Pier Head (960 metres approx.). Access from the Pier Head to the gallery is via The Strand. To get to Tate Liverpool, follow the brown signs to the Waterfront. Q-Park Liverpool ONE, with 2,000 underground spaces: 35 Strand Street, Liverpool L1 8LT. Visitors to Tate Liverpool can park at Q Park and receive a 50% discount on parking for up to 24 hours. Ask for a voucher from a member of staff when visiting the gallery. Coach parking is available at the Kings Dock Car and Coach Park, near to Tate Liverpool. More information for drivers www.albertdock.com. Visitors may also like to make use of Liverpool’s Shopmobility service, on the third floor of the Liverpool ONE shopping centre. Equipment must be booked in advance and there is a charge.l. More information for drivers www.liverpool-one.com. Admission to Tate Liverpool is free, except for special exhibitions. Become a Tate Member or Patron and get free entry to special exhibitions. The gallery is closed 24–26 December but open as usual on all other days of the year, including Bank Holidays, Good Friday and New Year’s Day. Tate Liverpool opens at 10.30 on the first Wednesday of every month. Limited pay and display parking is available near to Tate Liverpool inside the Albert Dock Gates near The Pump House public house (100 metres distance) and outside the Britannia Pavilion (100 metres distance). A Q-Park Liverpool ONE, with 2,000 underground spaces: 35 Strand Street, Liverpool L1 8LT. Visitors to Tate Liverpool can park at Q Park and receive a 50% discount on parking for up to 24 hours. Ask for a voucher from a member of staff when visiting the gallery. Tate Liverpool is located in the Albert Dock complex, which includes period features such as cobbles and original Yorkstone paving. There are no steep gradients on approaches to Tate Liverpool. There is level access to the gallery. The main revolving doors are operated manually. The two side doors open automatically and are push pad operated. The doors are single width. The door opening is 110cm wide. Five wheelchairs are available to borrow during your gallery visit. You can book one in advance or ask a member of staff for one on your arrival. Tate Liverpool welcomes guide dogs and hearing dogs. Visitors with a disability pay a concessionary rate, and carers’ entrance is free. Details are available on each special exhibition page. We welcome guide dogs and hearing dogs in the gallery. Drinking bowls are available – just ask a member of staff. Tate Liverpool provides a range of interpretative material including information panels, labels and leaflets. 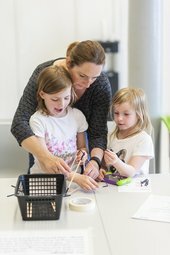 Find out whether an event at Tate Liverpool has visual description in the What's On pages. A range of portable loop systems are available for use in meeting and event spaces which can be used by visitors with or without hearing aids. Find out whether an event at Tate Liverpool offers BSL interpretation in the What's On Pages. We can provide various colours of transparent overlays, which may benefit some visitors with dyslexia when reading black-on-white text captions and leaflets. All artwork labels are available in large print at the entrance to each exhibition or display. Exhibition booklets are also available in large print. Please ask a member of staff. Just ask at the Information desk. Our programme for community groups offers a range of activities that can be tailor-made to suit the requirements of particular groups, such as visitors with learning disabilities. The Information desk at Tate Liverpool is located three metres from the front entrance. Staff are happy to help with any questions you have about the artworks, building and facilities. Female and males toilets are located next to the lift in the basement, 15 and 16 metres from the entrance respectively. There is level access to both toilets and the lighting levels are bright. between the rooms at the north end of the gallery on the first and second floors. All adapted toilets are unisex. A key is not required. The door to the ground floor adapted toilet opens inwards and is locked by a locking handle. As you face the toilet pan there is lateral transfer space of one metre on the left. The tap type is lever. There is a functional emergency alarm. Wall mounted grab rails are on both sides of the toilet. Hand dryer: less than 130 cm. Toilet roll holder: less than100 cm. Sink: less than 74 cm. The contrast between the walls and floor is good. Wall mounted and drop down rails are available. There is a Changing Places toilet​ at Tate Liverpool, located in the ground floor foyer. Changing Places toilets are also available at the Merseyside Maritime Museum which is within a 5 minute walk from the gallery. Information is available on the Maritime Museum website. Changing places toilets are also available at the Museum of Liverpool which is within a 15 minute walk from the gallery, and in Liverpool One which is within a 20 minute walk from the gallery. The facility is located in the Liverpool One Information Centre. The basement, ground, first, second and fourth floors are accessible to the public. There are two standard passenger lifts located opposite the main entrance. The right hand lift provides access to all levels; the left hand lift provides access to the ground, first, second and fourth floor. Lockers are available and free to use in the basement at Tate Liverpool. We kindly ask that visitors put large bags and rucksacks in our lockers for visitors' personal comfort during their visit and for the safety of the artwork. There is level access to the Café at Tate Liverpool. There is level access to the Shop at Tate Liverpool and ample room for a wheelchair user to manoeuvre.